[YYYY/MM/DD hh:mm:ss] [info] [Backupset_id] Backup job "Backup Set" is still running. [YYYY/MM/DD hh:mm:ss] [warn] [Backupset_id] Another backup job is still running. Backup skipped. The message suggests that a previous backup of the same backup set is still running, or the previous backup job had ended abruptly. Allow the in-progress backup job to complete before starting another backup for the same backup set (scheduled or manually). Restart the eazyBackup service afterward. Note: When a backup job is started manually or automatically at the scheduled time, a 'running' file will be created within the ipc directory to indicate that a backup job is in-progress. 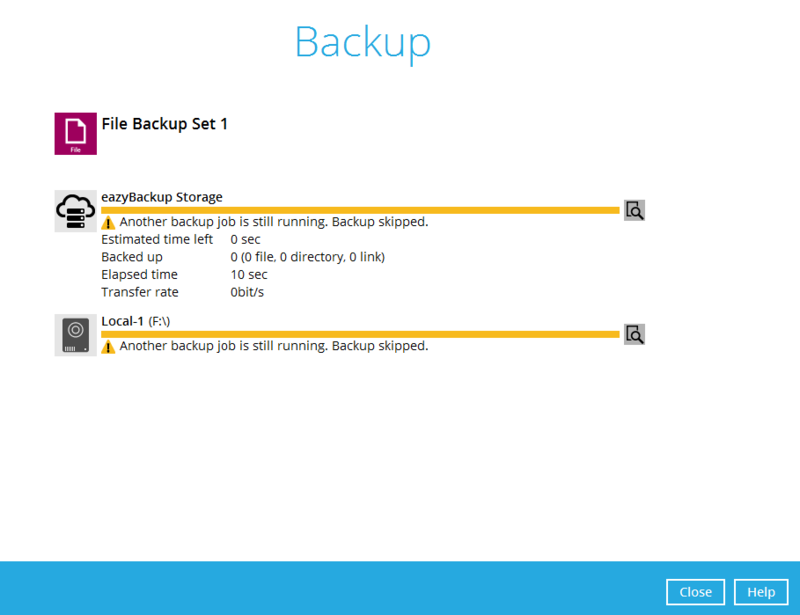 Under normal circumstance, the file will be removed automatically when the backup job is completed. However, for cases where the previous backup job was ended abruptly (e.g. server crash, client application crash), the 'running' file may not be properly cleared. When the next backup job is started, the client agent will detect that the 'running' file exist, misinterpreting that a previous backup job is still in progress.